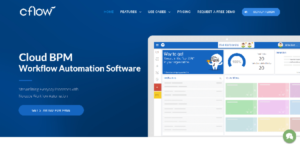 Cflow is a cloud-based business process management and workflow automation solution that automates and accelerates everyday processes without requiring users to deal with codes. The software optimizes and streamlines existing workflows, resulting in a dramatic improvement and creation of efficiencies that are easily scalable. Cflow is fueled by AWS Cloud, allowing users to optimize their workflows easily thanks to an intuitive wizard functionality while achieving security and reliability via tight data encryption and regular data backup. It eliminates the need to rely on the IT team to automate and optimize business processes as novice users can do the whole process by themselves in a matter of hours. Cflow speeds up your business processes via automation that is powered by AWS Cloud. Or if you need to create your own workflows, Cflow lets you do just that while providing you with tons of customization options so you can build processes that suit your prevailing standards yet gives you unparalleled flexibility, which allows you to achieve maximum scalability whenever your business requirements change. And you can do all that without having to deal with confusing lines of codes. There is no need for the IT team to get involved with your business processes. Cflow helps you achieve faster workflows that are fully tailored to your needs in a matter of hours. In terms of security, Cflow leverages tight data encryption to secure your processes and data. To ensure that data is not lost, the software backs up your data on a regular basis for easy and secure retrieval if and when you experience issues. Cflow boasts of implementing top-grade security measures to protect its systems and data. It is an impregnable platform, making it impossible for unauthorized parties to break in both physically and digitally. Because Cflow is cloud-based, this makes access to your systems, applications, data, and more faster and easier. Whenever you need to, you can view your business straight from your mobile device, perform your tasks, and make critical decisions quickly and easily. What Problems Will Cflow Solve? Problem: A lot of different repetitive tasks were carried out manually on a daily basis that leads to wasted resources – be it time, money or manpower. Solution: By automating repetitive tasks, Cflow helped customers bring everyday tasks into the digital world and get rid of papers and streamline the approval process in a singular manner to avoid confusion. Problem: New Product inquiries coming in on a regular basis and managing the status of these inquiries using emails and spreadsheets was a nightmare. Solution: With the help of Cflow, now they were able to create as many workflows as needed to move the lead from one phase to another. It also helps transition from running their sales process on emails and excel spreadsheets to an automated application. Problem: Spending a ton of money on different software for automating the various processes from Inquiry to Sale. Solution: An ERP becomes prohibitively expensive for them and leaves a big hole for them in the tracking and notifications area. Cflow had everything they wanted to use on a daily basis and even allowed them to easily create custom workflows that are flexible and powerful. Most importantly, it’s very affordable for them when compared to purchasing multiple software from different vendors. If you are interested in Cflow it may also be beneficial to examine other subcategories of Best Workflow Management Software gathered in our database of B2B software reviews. Companies have diverse needs and requirements and no software application can be just right in such a situation. It is futile to try to find an ideal off-the-shelf software app that meets all your business requirements. The wise thing to do would be to adapt the system for your unique requirements, staff member skill levels, budget, and other elements. For these reasons, do not rush and invest in well-publicized popular applications. Though these may be widely used, they may not be the perfect fit for your particular requirements. Do your research, investigate each short-listed platform in detail, read a few Cflow reviews, contact the seller for explanations, and finally settle for the app that provides what you require. We realize that when you make a decision to buy Workflow Management Software it’s important not only to see how experts evaluate it in their reviews, but also to find out if the real people and companies that buy it are actually satisfied with the product. That’s why we’ve created our behavior-based Customer Satisfaction Algorithm™ that gathers customer reviews, comments and Cflow reviews across a wide range of social media sites. The data is then presented in an easy to digest form showing how many people had positive and negative experience with Cflow. With that information at hand you should be equipped to make an informed buying decision that you won’t regret. What are Cflow pricing details? What integrations are available for Cflow? If you need more information about Cflow or you simply have a question let us know what you need and we’ll forward your request directly to the vendor.